Absolute Powerpop: Urgent new discovery alert! Yes, I've stolen the Drudge siren for this one. 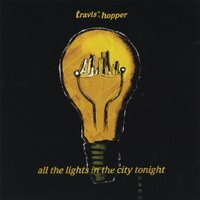 Travis Hopper's debut album, All The Lights In The City Tonight, is that stunning. I just finished streaming it in its entirety for the second time, back-to-back, having discovered it only a couple of hours ago among the CD Baby new arrivals, and I couldn't wait to spread the word. Before I go too much further, I should note that this is not power pop in the classic sense. It's more like poppy Americana (popicana? Ameripop? ), as practiced by Wilco (pre-Ghost Is Born), The Jayhawks, Salim Nourallah (who not coincidentally produced, mixed, plays bass and provides backing vocals here), and Whiskeytown-era Ryan Adams. I was hooked 15 seconds into the opening track, "Tietze Park", when Hopper sang "tonigh-igh-ight" and it didn't let me down from there. It's not too often you hear a 10-track album and fall for each track on first listen. Yet some tracks here are more equal than others, and particular highlights are those closest to power pop: "Saturday Night Christmas Lights", "Can't Tell You Why", "Should've Been In Love", and the marvelous Ryan Adams-ish closer, "Four Pictures". An assured a debut as I've heard, and right now it's going to be battling Supraluxe for my #1 spot in 2006. Just like I did, you can stream this album, uncut, at Mr. Hopper's site (the mp3 link for the one track appears to be broken). He has a myspace page up as well; but you'd be better served with the streams on his site, which sound of a better quality. And here's even better news: the disc itself is very reasonably priced at $8.99 on CD Baby. It's going to tough to find more bang for your cd buck than this. At times like these I like to quote the master, Not Lame's Bruce Bodeen: this disc is "Big Time Extremely Highly Recommended".